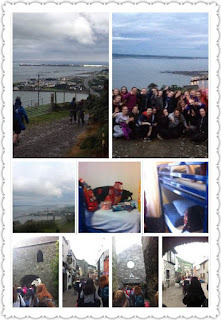 jessie's ty blog : Carlingford here we come !!! Hello again :) The time is flying by this year but no surprise due the fact that time flies when you're having fun !! 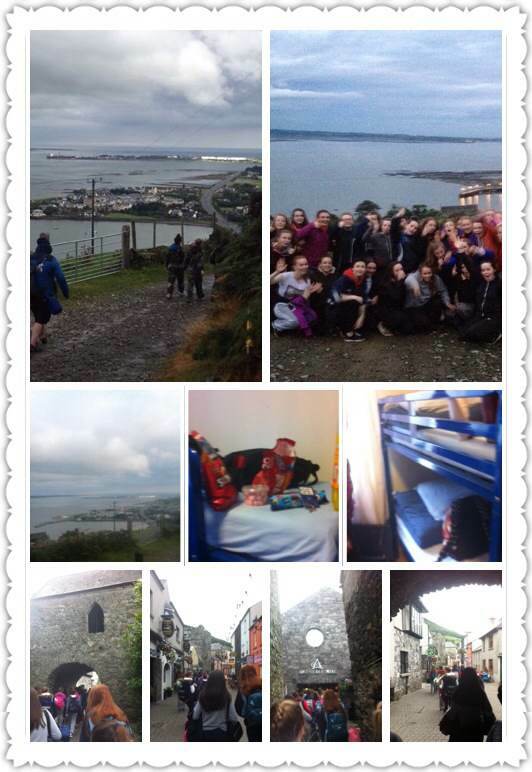 On Thursday 17th of September the two Ty classes alongside two teachers who were to join us were more than ready for our trip away to Carlingford. We arrived at school for 08:45 and were on the bus and gone by 9:15. The bus ride there was quite enjoyable, singing, jokes, pictures and curiosity as we thought about what awaited us there in Carlingford. We arrived at half ten and we were brought through the little village straight to the big hall in the adventure centre. We were split into two groups and after leaving our bags down, we were brought straight to our activities. My groups first activity was water activities. We walked to the water, popped on our wetsuits and grabbed a canoe and off we went. Ten people per canoe, My team and I headed for the water. Teamwork got us to our destination as well as a few songs to encourage us. We arrived to the centre of the lake where laid a wooden raft/ float for us all to jump onto. Once we were all on it we took turns jumping into the freezing cold lake, (if there was a chance you were half asleep before this you were certainly awake now). After jumping into the lake we were brought over to the water trampoline, one group of 8 at a time. Here you jumped on the trampoline into the water, it was quite wobbly so I couldn't stand up, I felt like a fish out of water :) We swam back to our canoes and together made it back to shore. We dried off and went back to the centre for a lovely light lunch. We then got back into our groups for our next activity. Ours was laser combat. We were dressed in camouflage and given our gun then we had to walk up a very steep hill to the forest where the combat would take place. Slightly out of breath we arrived to the location and were given our instructions. Sadly at this point it had started to rain making the ground muddy and slippery but we took little notice of it. We played against another school who had come to Carlingford from Longford. It was a great craic and I had really good fun even though I was out nearly every game towards the end :). Then we came back to the centre and we were given our room keys. We had a lovely room, My friends and I. After dinner we split into our groups again and climbed back up the hill to our previous destination.Here we were to do a night walk but the challenge was we were to complete the task blindfolded. As a blindfolded group we trailed up the hill and back to safety. We had to hold onto the rope with one hand and then hold the persons shoulder who was standing in front of us. Teamwork was key in this task and together we helped each other climb the hill and back down again.We had to climb up, turn a few times, crawl under things and all the while our leaders tried to scare us by yelling at random times, throwing leaves, and tapping us, it was really quite funny. 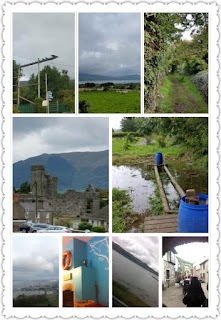 We take the scenic route back to centre getting to see incredibly beautiful views of Carlingford, from a hilltop view. The lights shine bright from the town bringing colour to the dark night, the water splashing off the shore. The town is quieter than celbridge is so it was quite peaceful ( well it was quiet until we came along) after singing down the hill we were brought to a castle where we played a quick game. Once back at the centre we were given free time. We were allowed go to the chippers or chinese and get some supper. Then my friends and I went back to our room and like most, had our own little party as our class put money towards getting sweets and because of this each room was given loads of sweets. Sadly we were too full to eat most of the sweets. The next day it was full steam ahead as we had to have our rooms cleaned and tidied, bags packed and ready to go by 9 o clock. We went for breakfast and then to our final activity. Our final activity was team building we were given tasks and challenges and ended with a zipline. It was really good fun. Saying goodbye to carlingford was sad as it was such an amazing two days but they are two I wont forget and I hope to return one day in the future. I feel closer with the people in TY and the class itself is closer. I'm really happy we were able to go and I hope that future TYs get to enjoy it just like my year and the previous ones did.